New Brunswick's Gordon Porter and his associates with the NB Association for Community Living are now in charge of New Brunswick's inclusive education system. The Gordon Porter Inclusive Education Review taking place in New Brunswick will impose their beliefs on NB students with disabilities including those with severe, complex disorders like my younger son who has severe autistic disorder with profound developmental delays. The review itself is unlikely to do anything except reiterate the Porter/NBACL inclusion beliefs which have not changed in 30 years. Although present for one of the Porter/NBACL review sessions in Fredericton it was made clear that the review did not want to hear from me; a known critic of those beliefs. My son's autistic disorder challenges are not simple. The extreme, everybody in the regular classroom inclusion model, is simple because evidence to the contrary is ignored by those who have pushed it. That is a simple fact. Harold -- My most recent post. 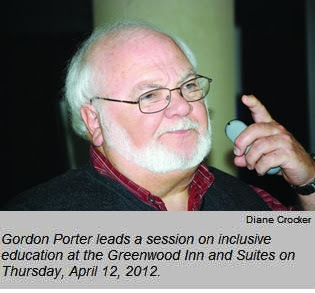 Gordon Porter is simple-minded to hold this philosophy as being the ultimate in equal rights for persons with disabilities. You could give me a flowered shirt and an expensive camera but I am still not going to truly be a part of a Japanese tourist group! Schools are meant for education, first and foremost (which I am often told when I ask about social skills training groups for my clients during school time)... what are these children being taught when expected to sit in a room with peers who are cognitively a lot older (and so is the subject matter). Keep up your advocacy Harold! You da man! Dr. Gordon doesn't seem to know much about severely autistic students. I wonder if he could articulate for us how exactly schools are supposed to include severely autistic children who scream all day, bite others, throw chairs, beat themselves,can't sit in chairs, won't listen to reprimands of "please be quiet" or "wait your turn." Oh for pete's sakes, this doc needs to spend a day with severely-autistic individuals who have self-injurious behaviors and seizure issues. My son was "included" in regular public education for a few years and it was a major challenge. He could only attend with a one to one nurse, who was trained (by me) to handle him at the public school site. Even then, the public school was in daily shock over his behaviors and seizures. The school tried hard, and they were very kind to him, but it wasn't something educational. It was mostly just warehousing him there, while the nurse would walk him around campus. The nurse later told me a few teachers made rude comments about my son, which was quite hurtful to me. A student in one class confided in me that when the nurse and my son would walk around campus, the teacher would complain about my son "making funny loud sounds." And how "irritating it was." whether the individual can profit from the advantages that integration provides." As such, if clinically proven integration is not legal and parents have a legal basis for remedy.